Every year thousands of people make New Years resolutions which they ultimately give up on within the first month or so. The act of making the list is rather rhetorical, as the majority know that they will never accomplish those resolutions. The list is made out of tradition, not with the intent to succeed. A resolution is an action taken to resolve a problem. Who wants to start the new year thinking about a list of problems they must tackle? A New Year’s resolution is a cumbersome burden no one wants to bear. Just the sound of it is overwhelming. Throw those resolutions out. You are not going to accomplish them anyway. Instead list your goals for the new year. Think positive, dream big. These are things you want to accomplish over the course of the next twelve months. * List your resolutions for the new year — those problems you intend to resolve. * List your goals for the new year — those things you want to achieve. Which phrase encourages you to take action? Which phrase makes you go uggghhh? Do whatever provides you with the most motivation. If taking a slew of problems you have resolved to correct inspires you, then by all means go for it. If setting forth a list of goals to complete inspires you, then take that route. The desired outcome, whether you choose to set resolutions or goals, is to cross those items off your list one-by-one as you complete them. Every item you cross off the list provides you with a feeling of accomplishment. The more things you cross off your list, the more encouraged you will be to keep working on that list. What are my plans for 2017? I have made a resolution to resolve problems by setting forth a list of goals to accomplish within the next year. We all have an impression in our mind of what certain people should look like or behave like. Impressions that are imbedded in our minds from past experiences, misconceptions or any other wide range of factors. When we meet someone who does not meet the criteria our mind has set forth the reality is quite shocking. Chances are everyone who is reading this post has either been the subject of or subjected someone else to impressions that do not match reality. 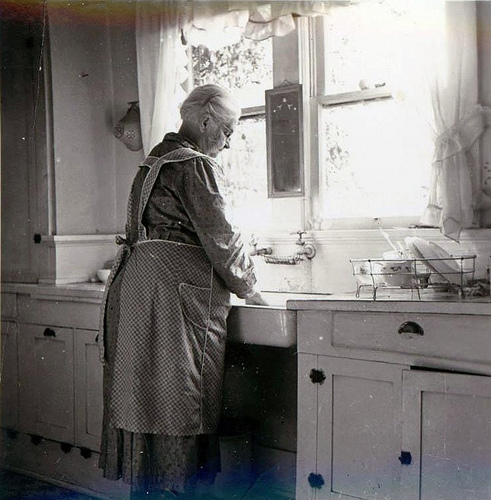 When I think of the term “grandmother” I picture my own grandmothers, grey haired ladies who did their hair with pin curls, wore full length aprons, never worked, never drove a car, and were great cooks. That is the image that always comes to mind for grandmother, but I and numerous friends are the living reality that that is not the case now. Modern day grandmothers work full time, drive cars, travel, are involved in activities, and although some of us may be great cooks we do not wear aprons. So why can’t I shake the image in my mind of what a grandmother should look like? Because that is what my grandmothers looked like and it is most likely what most grandmothers looked like in that era, but it is no longer the reality. 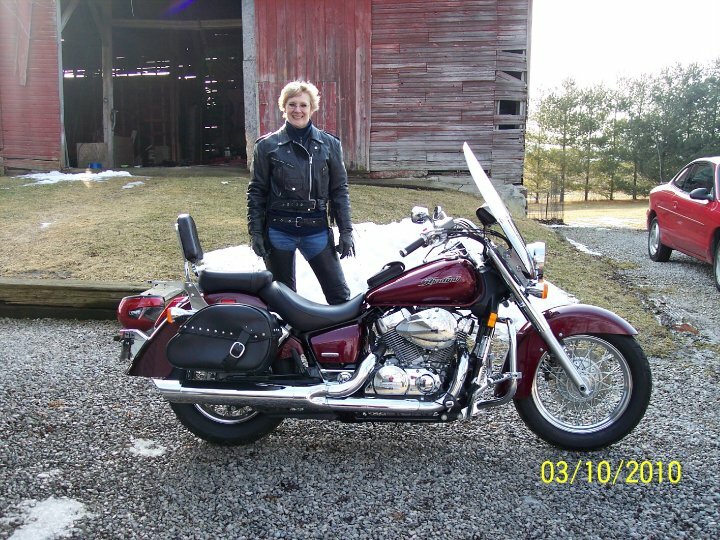 Motorcycle Gear – a photo of my friend Vicki dressed to ride. Photo obtained from her Facebook page. 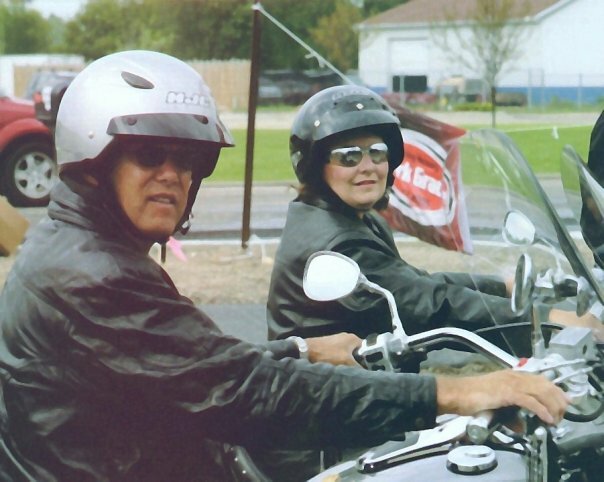 My husband and I participating in a poker run. What does a biker look like? Back when I was in physical therapy following my motorcycle accident, one of the other patients asked what happened to me and when I told her she responded “You don’t look like a biker.” She thought that people who rode motorcycles were always dressed in their leather vests, coats and biker boots. I explained to her that people who ride motorcycles only dress that way when they are riding, but they are ordinary people who hold a variety of jobs, doctors, lawyers, salesmen, etc. and they wear normal, everyday clothing suitable to their profession. When I was riding I did encounter people who treated me differently when I was dressed in my motorcycle gear, to the extent that I would say some were nervous. What was funny was had I approached them without the leather vest or jacket they would likely have treated me the same as they were others. Regardless of my clothing I was the same person. People allow their minds to cloud reality and the impression they have set in their minds can cause them to prejudge. I recently read a person’s letter to the editor in a newspaper in which the writer was commenting on a person who entered the McDonald’s he was at and voiced an objection about a non-handicap marked vehicle being parked in a handicap spot. The writer was the person who had parked in that spot, did not have the state-mandated handicap tag but was on crutches and parked there. 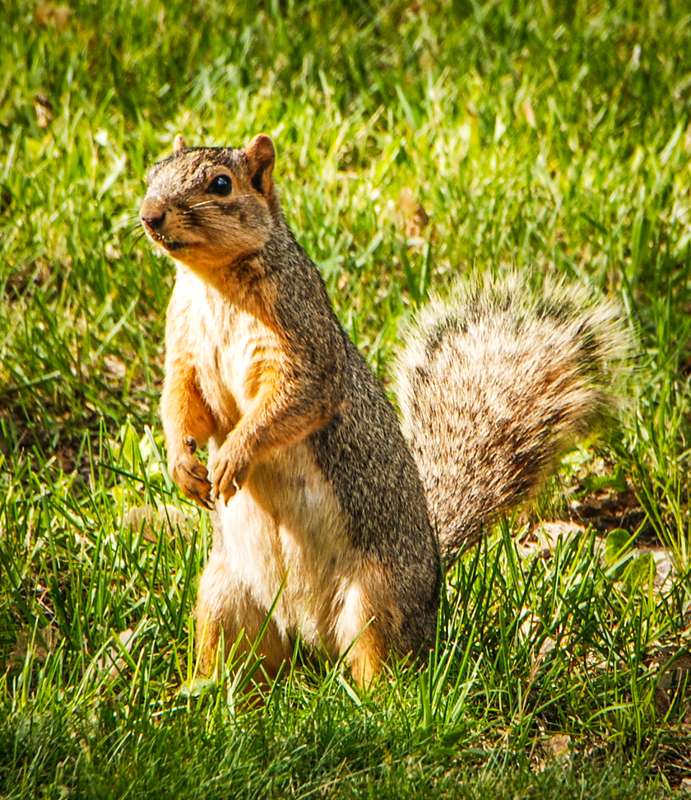 In referencing the person that had objected to the spot being taken, the writer stated he “seemed to have nothing wrong with him other than being a bit overweight.” What classifies a person as being handicapped? They do not have to have an obvious physical disability that stands out and screams “I am handicapped.” Persons who have obtained handicap markings for their vehicles have to obtain a doctor’s note specifying why they need handicap designation and then that document goes to the Secretary of State to obtain the appropriate tag for the vehicle. Most people who do not know me do not realize that I have been in an accident and have a handicap parking designation on my vehicle. I worked very hard to not have a limp after my accident, so when I walk into a building people do not realize that under my slacks I am wearing a compression sock and either a leather boot that supports my ankle or an ankle brace and that my ankle almost always has some level of swelling. I have mastered the technique of getting in and out of my car so that people do not realize that to exit my vehicle I have to be able to open my car door all the way to put both feet firmly on the ground before standing up or that to get back into the vehicle I have to open the door all the way to get my left leg in a specific position to sit down. My disabilities are for the most part not detected by the general viewer. Therefore the impression of what a handicapped person is and whether or not they should be using a designated handicap parking tab and the reality of what may qualify a person for such a designation can be very different. I recently photographed a wedding in which I was shocked when I realized who the minister/pastor was. My impression of a clergyman is someone who is conservative, soft spoken, and always uses a traditional version of the bible. Wrong! 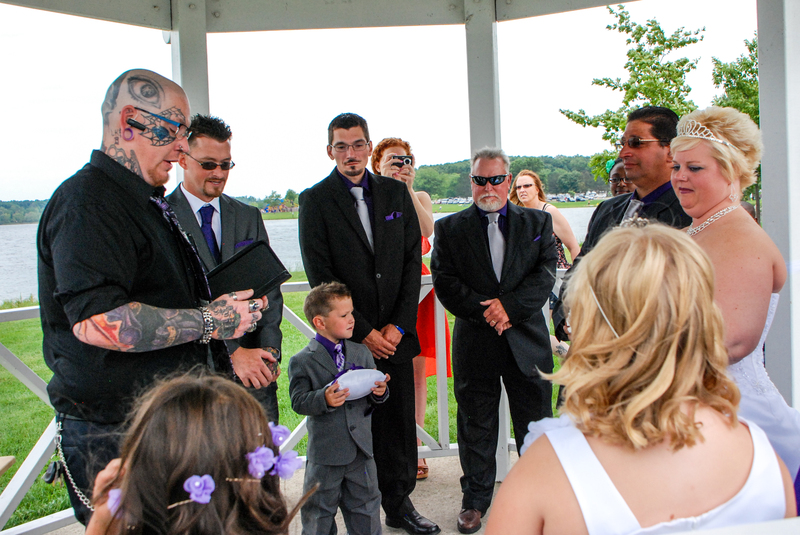 The pastor/minister that conducted the ceremony was a very nice person, but did not fit my mind’s impression at all. He was tattooed, had some piercings and used an electronic pad instead of a traditional bible. I was very surprised when I realized he was the person officiating the ceremony and not a guest. Had I met him on the street I would never believed he was a minister/pastor. The combination of the handicap posting and my surprise at the minister/pastor’s appearance at the wedding is what led to the creation of this post. Impression v. Reality can be a fun experience if you accept that what you mind thinks is correct may not be accurate. The experience of learning how the mind plays tricks on you can be very enlightening. If you have experienced the surprise of Impression v. Reality please share you experience here.